UN Secretary-General and dozens of ambassadors from around the world participate in Tashlich event at the UN headquarters. 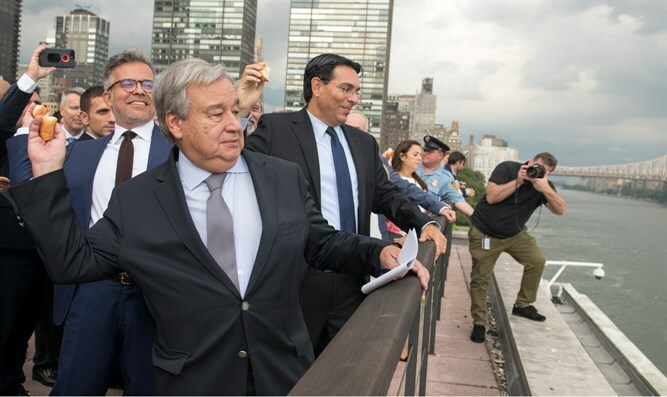 United Nations (UN) Secretary-General Antonio Guterres and dozens of ambassadors from all over the world participated in a festive event on the banks of the East River in New York in honor of Rosh Hashanah (the Jewish New Year). The event, organized by Israel's Ambassador to the UN Danny Danon and the European Coalition for Israel, was attended by Guterres and dozens of ambassadors and dignitaries from around the world.The ambassadors symbolically cast their sins into the river and blessed the State of Israel for the new Jewish year. Ambassador Danon opened the event by saying that “as the Jewish New Year begins, the UN is also beginning a new year. "We hope the UN will participate in cheshbon hanefesh, an accounting of its actions of the previous year," Danon said. Guterres said, "I would like to take this opportunity to offer my blessings to the Jewish people." Gregory Lafitte and Tomas Sandel, co-founders of the European Coalition for Israel, said that "without the Jewish inspiration and contributions to the creation of the UN there would probably be no UN today." "Tashlich is a good time to reevaluate, to see where we have missed our mark."